Metric Labs’ office is located in a shared warehouse in Redfern, which means parking fines are an ever present risk. Our fellow warehouse residents recommended Park Patrol, an app that relies on crowdsourced reports to alert users to nearby city rangers. If you see a parking inspector anywhere, you can open the Park Patrol app and tap just one button. The app knows your location, and immediately publishes the time and location of your ranger sighting. Anyone in the vicinity who’s using the app is then alerted to the presence of a parking inspector. 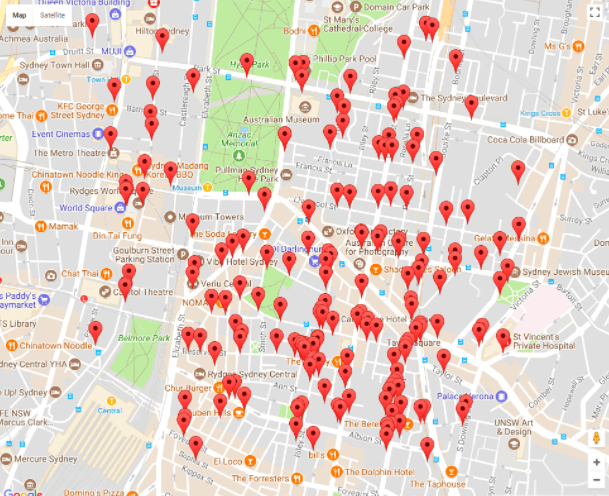 While building a crowd-sourced, community minded service, Park Patrol has inadvertently become a reliable source of (anonymised) data on where and when parking inspectors are spotted. We’ve been tinkering to see if we can predict where and when parking inspectors usually show up. 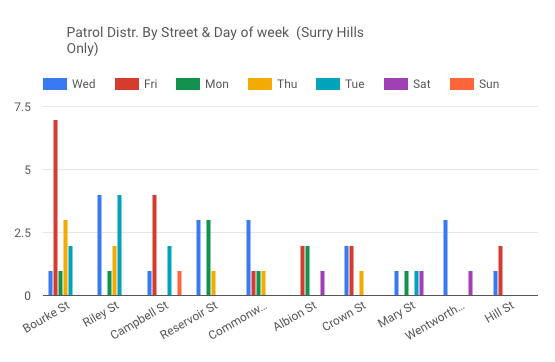 We have a very small data set that covers about half of Surry Hills, for about 10 days. This was an exercise to see how we can set up the Park Patrol data to be able to pull useful information into Google’s Data Studio. We want to have a flexible, reliable, and easily understood visual report that can eventually be used as a resource for anyone who might want to know when inspectors are most likely to show up wherever they are parking. You can see what we’ve found so far below. Keep in mind we’ve used a very small sample, and also that the Park Patrol app uses crowdsources inspector sightings – so inspectors might be showing up but they are not seen by any app users, or app users could be reporting inspectors that don’t exist. In our experience, when we receive an alert and head out to move the car, we usually see an inspector somewhere on the street. So in inner Sydney at least, people are taking parking inspector sightings seriously. Looks like rangers show up mostly in the middle of the day. The middle of the week is also a popular with inspectors. People on Bourke Street see a lot of parking inspectors (but Bourke Street is also quite long). You can see the geographical area we captured in the map at the bottom of this blog post. 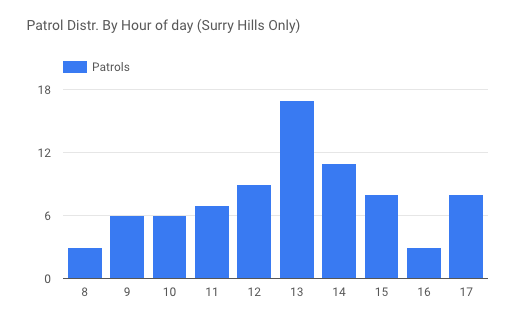 This breakdown shows how many city rangers are spotted on each street by day. 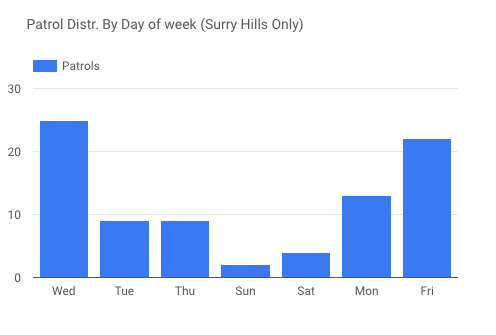 We’re still working on getting Data Studio to display this in an easier to read way – for example, showing the days in order. This map shows all the data we had. It covers Some of Surry Hills, some of the Sydney CBD, and parts of Darlinghurst. 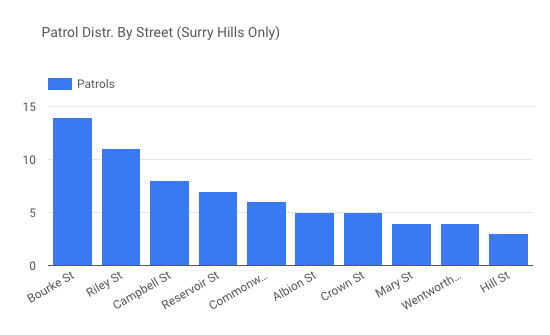 When we built the report we restricted the geographical area to Surry Hills only. We have a larger data set that we’ll be playing with now we’ve done the initial set up. Hopefully we’ll be able to see some new patterns, or reinforce what we’ve found so far. We’ll update the Metric Labs blog with what we find, so stay tuned. Send us a message and we can chat through your current situation and offer some pertinent advice to help you get ahead. © 2018 Metric Labs. Digital Agency from Sydney.